Can we all just take a moment to thank the person who soaked bread slices in eggs, fried them in butter, covered them in syrup, and then decided to call it breakfast? That person is a genius. I have a strange feeling it’s the same person who got away with calling this dessert a salad. Ya gotta love that guy. French toast has to be one of the greatest rationalizations of our society. No, no, it’s not dessert! It’s just toast! Eggs and toast. It’s totally breakfast! Don’t get me wrong, I looooove the french toast. But I’m under no illusions of it’s nutritional value. At the heart, it’s fried bread with sugar sauce that inevitably coerces me into taking a nap 30 minutes after I consume it. Been there, done that. (I also love naps….just FYI). Because of it’s tendency to cause food comas and entire mornings of negative productivity, I had relegated french toast to weekend only breakfast status. Then, there was angel food cake french toast. Oh maaa goodness. It’s like eating a golden fried cloud. It’s just a little crispy on the outside but light and fluffy on the inside. It’s a tad sweet, but not so sweet that you can’t cover it in blueberry lemon sauce and a dollop of whipped cream. It won’t induce extreme napping, lethargy, and/or an impromptu marathon of the first three seasons of Arrested Development. This angel food french toast is one of the great deceivers of the food world. It looks like dessert. It tastes like dessert. It feels like a total splurge. But it’s actually a fat free, low calorie cake. Sure, it goes around at parties masquerading as dessert, chatting it up with turtle cheesecake and double chocolate trifles. But deep down, it’s actually sorta kinda healthy. Angel food is a total faker. Which means you can have it for breakfast. On a weekday. And go to work afterwards and not fall asleep on your keyboard. The #SundaySupper team is talking summer berries this week, which is probably my favorite thing in the ENTIRE world. I live for this time of year. This blueberry lemon sauce really allows those summer flavors to shine. It only takes about 10 minutes to cook down into a sweet, bright, syrupy topping for the angel food french toast. This is a breakfast you can get behind, whether it’s a Sunday brunch or a Monday morning before work. Be sure to check out all the other ways our #SundaySupper team is using fresh berries. From savory dinners to jam to cocktails, we’ll make sure you find a way to use all those glorious berries! In a shallow medium sized bowl whisk together eggs, milk, and vanilla. Slice the angel food cake into 10-12 slices, depending on your preferred thickness. Heat a skillet over medium heat. Place a dollop of vegetable oil in the pan and wait until it shimmers and is very liquidy. That's how you know it's good and hot! Dip the slices of angel food cake in the egg mixture, being sure to generously coat both sides. Place the slices directly in the skillet and cook until golden brown on both sides. Repeat with remaining slices. Place blueberries, sugar, lemon zest, lemon juice, water, and cornstarch in a sauce pan and stir together. Bring the mixture to a boil, then reduce heat and continue to simmer for 5-10 minutes, or until mixture is slightly thickened and blueberries have begun to break down. I prefer to leave my blueberries whole, but you can feel free to smash them at this point. Serve cooked angel food slices with several spoonfuls of blueberry sauce and a swirl of whipped cream, if desired. Oh my gosh, what a wonderful breakfast! I LOVE it!! What a fantastic idea! And so creative!!! Can’t wait to give this a try! I never quite understood the fascination with angel food cake, but then again, I never used it for french toast… with berries! You certainly found a way to make this cake really interesting! I tend to agree. I’m much more of a shortcake girl myself. But this brings angel food cake to the next level! This looks amazing. I loooooove angel food cake in any way shape or form, but I think this way might be the best! It’s a great way to quell a sweet tooth without tons of calories too! wow this looks GREAT! It never occurred to me to use angel food cake instead of bread. Wish I could have some with my coffee right now! I love the sound of angel food cake made into french toast. What a great idea! Oh my goodness -this is a brilliant idea. I must make this next time we do French Toast. It’s great if you just have half an angel food cake leftover as well. That’s how the idea originated! Oh my gosh – this is GENIUS!!!! 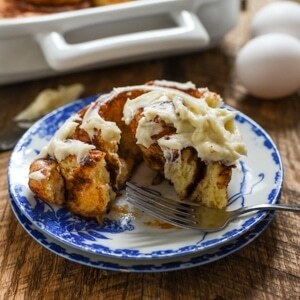 I never would have thought to make french toast with angel food cake, but I MUST try it! I actually just made an angel food cake today…perfect timing!!! I am so trying this, it looks heavenly!! Your photos make me want to grab a fork and dive right in. Especially because blueberry + lemon is my most favorite flavor combination! What an amazing breakfast idea!!! Kicking French toast up a notch by using angel food cake…plus adding an irresistible berry sauce! 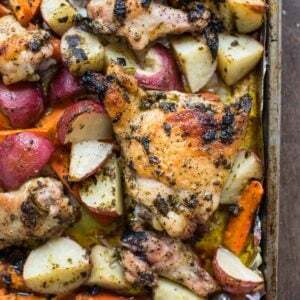 OMG I love angel food, and this is such a cool use for it! I thank you, my momma thanks you, and my daddy sends his thanks from heaven. Oh what a fab-u-lous treat!!! WOW is all I have to say about this treat! What a fabulous idea and I’m sooooooo trying this!!! My husband will LOVE me up! Courtney, you’ve officially taken over genius status from that guy by thinking of frying angel food cake! Amazing! I can’t believe how incredible your french toast looks. It’s so golden ‘n crispy on the outside. Holy yum. This is very similar to the french toast served in Hong Kong style cafes. They use a sweet Chinese egg bread, slather coconut jam in the middle of two slices, dip it into egg, deep fry it so that the outside is ridiculously crispy and then smother it in syrup. It’s a thousand calories but worth every bite. I love that this is healthier yet just as indulgent. Your french toast looks amazing! And the blueberry lemon sauce… YUM! I’m definitely going to need to try this. Oh such a genius idea to serve a French Toast with Angel Food Cake!And it looks so decadent and lipsmackingly delicious! !I can now enjoy this beauty without guilt 🙂 Thankyou!! OH! I would have this everyday! OMG, this looks sooooo good! I love how you described it. . like eating a golden fried cloud. . . a little crispy on the outside but light and fluffy on the inside. Perfection!!! Totally going to try this, yumm! Wow this sounds so good. The berries put it over the top! What a clever idea. I love angel food cake so the idea of cooking it up like french toast for dessert sounds delectable. Holy yum! This sounds amazing! I am definitely going to have to try this out for breakfast in the near future. This looks and sounds so good ! I have all the ingredients at home so I might just make this for breakfast tomorrow !! Thanks for sharing !